COMU® features optimal properties as a peptide coupling reagent. In addition to its high and fast coupling efficiency, it shows very low or non-existent tendencies for racemization. COMU is a registered patent of Luxembourg Bio Technologies (No. 101784522/8,524,898). COMU® is a registered patent of Luxembourg Bio Technologies Ltd., and we are the exclusive manufacturers. Epimerization during fragment coupling appears to be lessened with COMU than with HOBt or HATU. COMU is fully compatible with microwave-assisted peptide synthesis. 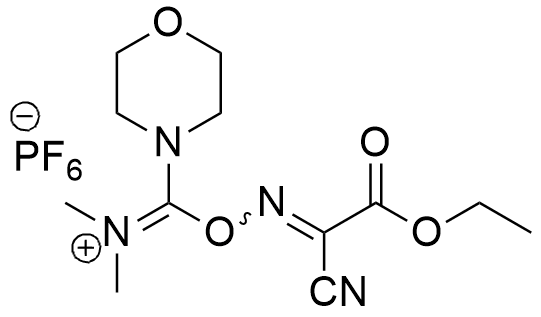 COMU is very soluble in most commonly employed peptide coupling solvents, such as DMF or NMP, which makes it ideally suited for solid phase peptide synthesis. It is equally attractive for solution phase synthesis since by-products formed by COMU are water-soluble and can be separated by simple extraction. A color change during the reaction allows visual or colorimetric reaction monitoring. COMU can be used with nearly identical protocols that apply for common coupling reagents such as HBTU, TBTU, PyBOP, or HATU. 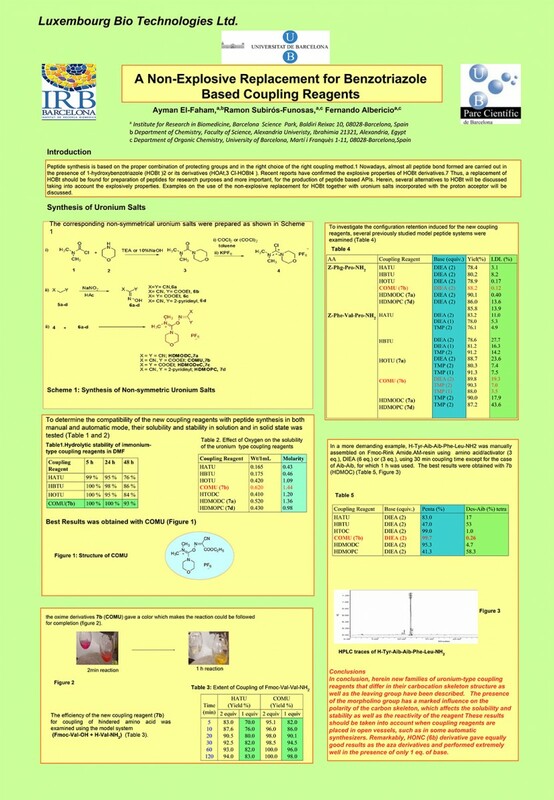 It is considered the greener coupling reagent. It is used in some Canadian schools. COMU: A Safer and More Effective Replacement for Benzotriazole-Based Uronium Coupling Reagents. A. El-Faham, R. S. Funosas, R. Prohens, and F. Albericio Chem. Eur. J., 2009, 15, 9404–9416. A. El-Faham and F. Albericio J. Pept. Sci. 2010, 16, 6–9. Tofteng, L. Malik, S. L. Pedersen, K. K. Sørensen, K. J. Jensen Chem. Soc. Rev., 2012, 41, 1826–1844. J. K. Twibanire and T. B. Grindley Org. Lett. 2011, 13, 12, 2988–2991.